Bhakra Dam, is situated at a height of 226 m above sea level, stuns the visitor with its sheer height. 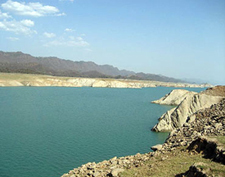 The 90 km long dam is spread over an area of 168 sq km and is a combination of Bhakra dam and Nangal dam. 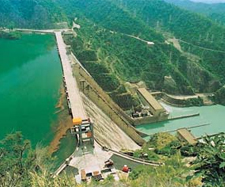 Bhakra dam is 13 km upstream from Nangal city and Nangal dam, on the other hand, is 13 km down-stream. The construction of Bhakra Nangal Dam was started in the year 1948 and was completed by the end of year 1963. Initially, the construction of the dam was started by Sir Louis Dane, the Lieutenant Governor of Punjab. But the project got delayed and was restarted by the reoriented and phased soon after Independence. In October, 1963 at the ceremony to mark the dedication of the Bhakra –Nangal Project to the Nation, Prime Minister Jawaharlal Nehru said- "This dam has been built with the unrelenting toil of man for the benefit of mankind and therefore is worthy of worship. May you call it a Temple or a Gurdwara or a Mosque, it inspires our admiration and reverence". it is fifteen km from naya nangal and twenty km from naina devi. Gobind Sagar Lake over the Sutlej River is a huge reservoir and is the result of Bhakra Nangal, the world’s second highest gravity dam. It is a major landmark of Bilaspur District. It covers an area of 170 sq km and its length extends up to 90 km. The lake is named in honor of Guru Gobind Singh, the tenth and last guru of Sikhs. In October and November, the water level of the reservoir is at peak and a series of boat races are organized by the Department of Tourism and Civil Aviation. The water sports activities such as water-skiing, sailing, kayaking and water-scooter racing can be enjoyed during this timeA wide range of facilities such as speedboat and ferry rides are available to explore the lake. The mountaineering institute here conducts water sports festival every winter.